A château with a long and storied history, the Château de Chenonceau was first built between 1513 and 1521 by Thomas Bohier, who used it for hosting French nobility including King Francis I. 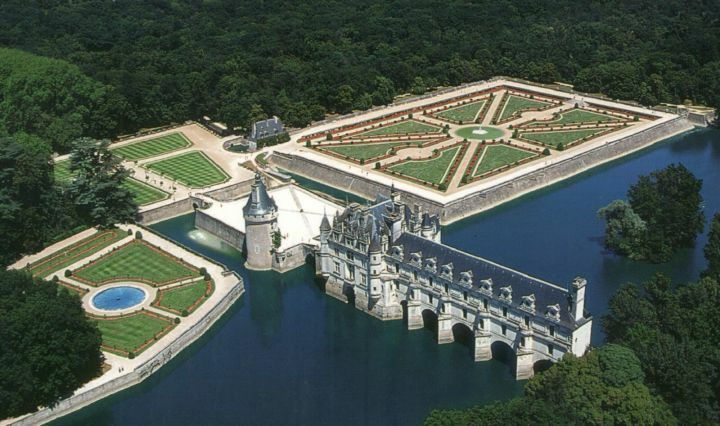 However, by 1535 the Bohier family's debts to the Crown had become so great that King Francis siezed the château; and following Francis' death, his son - King Henry II - offered Chenonceaux to his mistress, Diane de Poitiers, as a gift, despite his wife Catherine de Medici desperately wanting to own it. A crafty and intellectual woman, Diane possessed a great amount of power within the French Court, even writing many of King Henry's official letters on his behalf; though the position of the "royal mistress" was expected and tolerated in an era when royal marriages were enacted solely for political and dynastic reasons, Henry's adoration for Diane caused a great amount of jealousy for Queen Catherine. Knowing that the château was still legally owned by the Crown, and thus could be taken from her if the king ever died; though years of complex legal maneuvers, including returning it to the now-impoverished Bohier family, Diane was able to take ownership of the castle for herself in 1555. With the knowledge that the castle was hers, and the profits from the cultivation of the estate, Diane set about having it improved and enhanced: she had a new bridge built, connecting the castle to the opposite bank; expanded and improved the main building; and oversaw the planting of large flower and vegetable gardens along the banks of the River Cher, which the castle spans. The 19th century writer Gustave Flaubert wrote that Diane de Poitiers' bed, in the master bedroom, had an "extraordinary" effect on those who lay on it. Unfortunately for Diane, her efforts to maneuver Chenonceau into her own hands proved somewhat fruitless. When King Henry died in 1559, Diane - who, despite Henry's pleas, was not admitted to see him or even invited to the funeral - was pressured into giving the Château de Chenonceau to Catherine, in exchange for Catherine's Château de Chaumont. Taking up residence in Chenonceau, Catherine did her best to strip the vestiges of Diane's ownership from the castle; but rather than destroy the garden Diane had created, Catherine instead created her own, intending to outdo her rival. For more pictures and information on Chenonceau, you can visit the château's website here - and if you want to experience Diane's gardens (and Catherine's!) in person, we ride out to the castle on our Loire Valley cycling tours, now open for enquiries and bookings for 2018; we have Loire Valley tours running from June to September.